What Kind of Snake Is Black & White? North America is home to a wide variety of snake species, most of which are members of the non-poisonous Colubrid family. Many of these snakes are black or very dark brown with white or light-colored markings. Learning to identify these creatures can be an interesting project. 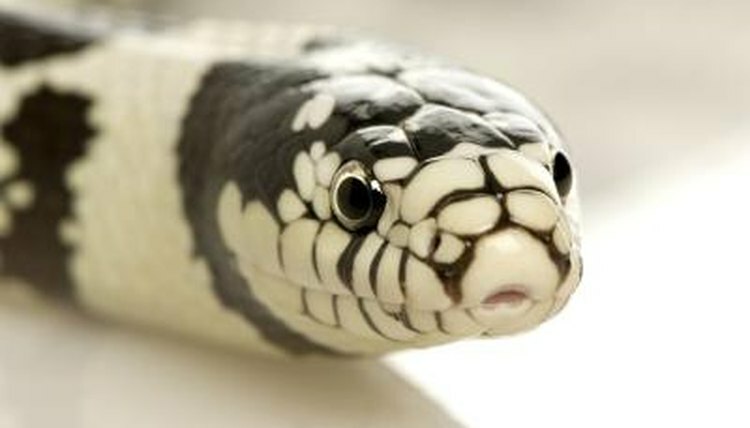 Several black and white snakes are common throughout the United States. This snake is usually between 18 and 26 inches long, but some exceptional specimens can get up to 49 inches in length. Garter snakes tend to have dark gray to black bodies with three light yellow to white stripes running down their length. 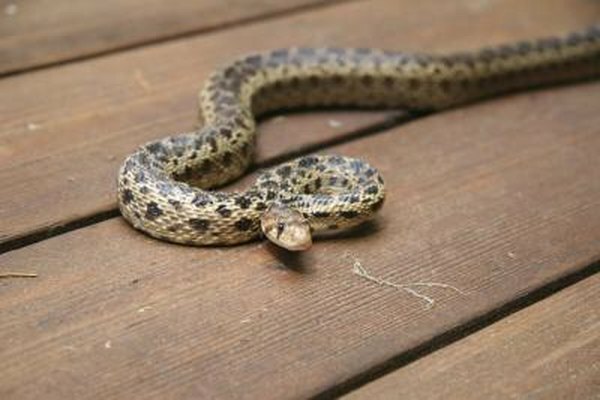 A few unusual snakes have checkered bodies and a blueish or reddish tinge. These snakes are active both during the day and at night and eat worms, frogs, toads, fish, tadpoles and slugs. They are common in wet environments, such as near streams or ponds, and are not dangerous. The black rat snake lives from the east coast through midwestern North America. It has a black body with a white chin, though hatchlings may be pale gray, marked with black blotches. Over time, this snake darkens, and can grow to be 4 to 6 feet long. 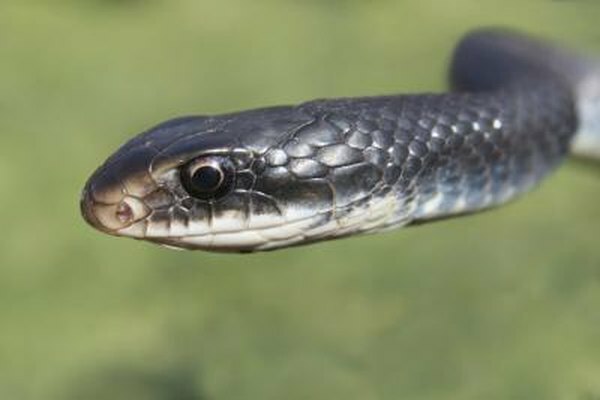 As its name implies, black rat snakes eat mice, small rats and other rodents. They are also willing to consume small frogs, lizards and young birds and their eggs. This relatively shy snake freezes when it encounters humans. It may also produce an unpleasant smell or rattle its tail in leaves to imitate a rattlesnake. 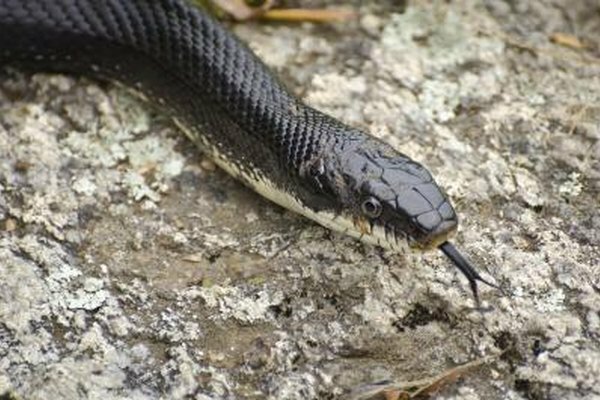 If provoked, black rat snakes may bite, but do not do much damage. 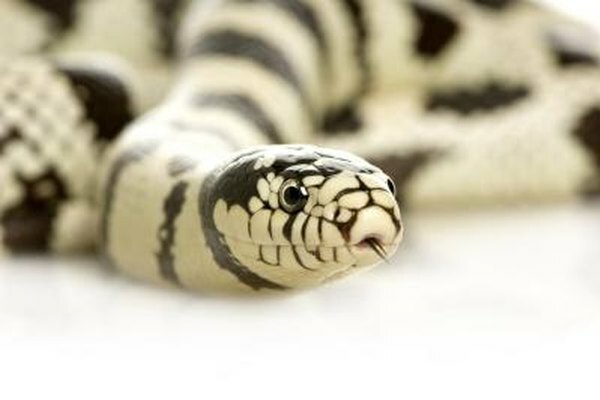 Popular in the pet trade, this subspecies of the common king snake has a black or dark brown body with white or yellowish rings. Some specimens are very striking and have high-contrast scales. A few individuals have stripes running down their length, or broken white splotches instead of rings. Like black rat snakes, California king snakes vibrate their tails when disturbed. They may also roll into a ball and hiss loudly. This snake eats a wide variety of prey, including rodents, amphibians, birds, insects and other snakes. This blotched brown and cream or black and white snake is native to western North America, and lives in a wide range of habitats, including forests, deserts, fields and prairies. These snakes can be quite large, growing between 6 and 9 feet long. Their speckled scales superficially resemble those of rattlesnakes, and gopher snakes may be mistaken for them, since they also mimic rattlesnake behavior. However, these solitary snakes are actually important in controlling rodent populations and tend to hide from humans. When disturbed, gopher snakes can inflict a painful bite. This snake looks much like the black rat snake, with a black body and white chin. However, black racers are usually smaller, and tend to have more white markings than rat snakes. Juveniles are white to gray with brown or black spots. This nervous snake will readily bite in its own defense, though it causes little damage. Like other species, it vibrates its tail in imitation of rattlesnakes when disturbed. 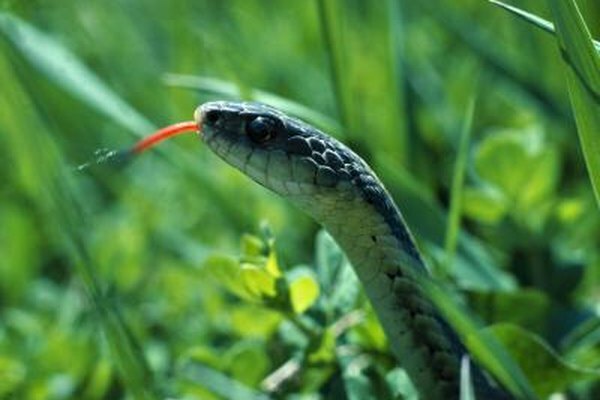 Black racers eat rodents, lizards, other snakes, birds and their eggs and frogs and other amphibians. 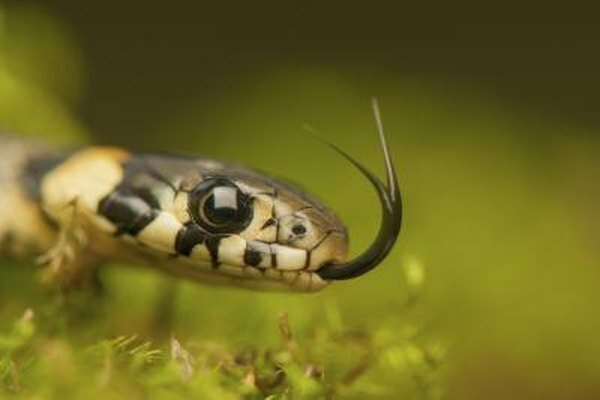 This relatively small snake grows to be 1 to 2 feet long and has a dark gray, black, brown or olive body with a single white to yellow stripe on its underside. Queen snakes have a reddish belly with two rows of dark spots running its length. These aquatic creatures eat mostly crayfish, but will also consume water bugs, fish and tadpoles. They bask under rocks and logs close to the water. Queen snakes are relatively shy and live primarily in the eastern to midwestern United States.